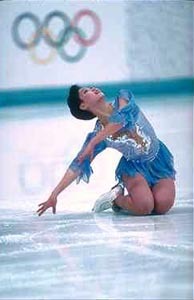 In many ways, photographing figure skating is similar to photographing hockey because both sports are performed inside an arena on a rink. But there’s one big difference. 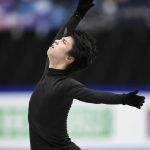 While hockey pictures usually concentrate on the brutal aspects of the sport, figure skating photos typically emphasize the grace and beauty. Having said this, however, we must admit that audiences (and judges) seem to be far more concerned with athletic prowess in the jumps than they are with the delicate balletic movements between jumps. How can you best capture this athleticism as well as the beauty? Where are you sitting? If you’re ringside with your camera, that’s one thing. If you’re sitting back in the stands, that’s another. Fortunately, sitting in the stands in a typical skating arena is not the same as sitting in the stands at a football stadium or Madison Square Garden. Usually, skating arenas are smaller and more intimate, with seating perhaps only ten rows deep. So being in the stands at most figure skating competitions or exhibitions is not as photographically challenging as being in the 50th row of a large football stadium. In addition, skating audiences are usually more polite than their counterparts at more aggressive sports, which means that, when the skater leaps and gyrates, the spectator in front of you is less likely to stand up and block your view and knock over your camera. With these thoughts in mind, let’s turn to taking ice skating photos. While the “normal” lens on your point-and-shoot may give you a nice wide-angle picture of the arena, you will need a telephoto lens to get in close to the action – that is, to fill the frame with your subject. What if your point-and-shoot has a zoom lens, and you can zoom out to 105mm or even 180mm? Can you rely on it? Probably not…for another reason! Most point-and-shoot cameras have a delay of up to a second between the time you press the shutter-button and the time they snap the picture. During this momentary delay, the camera has to automatically set the focus, automatically set the shutter speed and aperture to produce the “right” exposure, and automatically “decide” if you need flash. While a second is not long in a lifetime, it is far too long when it comes to snapping the shutter and getting a picture of the “decisive moment” – in this case, the high point of a jump or other maneuver. Unfortunately, you’re likely to end up with a picture of the skater back down on terra firma – or, at least, down on the ice…if the skater is even in the field of view at all! This problem of delay can also afflict some SLR’s when they are set for autofocus and autoexposure. So our advice is to use an SLR, but set it to Manual Mode if possible. This way, you’re in charge of focusing and exposure, and you should set them in advance so there won’t be even a millisecond delay when you snap the shutter. How do you set focus and exposure in advance? Pre-focus on an area of the rink near you. You won’t be focused for the fireworks that occur farther away, but skating routines bring the performer to your side on each oval, and you’re prepared to shoot whenever the performer is in your pre-focused zone. Set your exposure in advance too. Remember, you are aiming for correct exposure of the performer in the glare of the spotlights – not for correct exposure of the ice or the spectators in the stands. Even if your seat is not ringside, we advise that you walk up to ringside before the festivities begin. Take your reading at ringside. Perhaps, you can get a reading of your own skin in the glare of the rink lights. Or you can get a graycard reading in that light. Use this reading as your exposure. Now return to your seat, and set up. You will be using a long lens. How long? This depends on the size of the arena and the location of your seats. Probably 180mm or longer. Of course, when you use a long lens, you cannot safely handhold. You want to avoid camera-shake. Our suggestion is that you set your camera on a monopod to steady it. If the spectator in front of you jumps up, you’ll end up with a great picture of his back…but, as we’ve mentioned, this is far less likely at staid figure skating events than at raucous hockey or football games. Since you are using a long lens and you will often want to freeze the action with a fast shutter-speed. That means you may need to set a higher ISO on your digital camera. If you’re using a film camera, ISO 800 film from either Kodak or Fuji is extremely good. Now, what about shutter-speed? As we just said, you will often want to freeze the action with a fast shutter-speed. But not always. We suggest that you also try to capture the feeling of speed and action in your picture by using a slow shutter speed to blur the skater and the action. To do this, bracket different shutter speeds – starting at 1/15th and getting slower – 1/8… 1/4… 1/2… etc. Also, try panning some shots by following the movement of the skater as you press the shutter-button. A good pan will produce a sharp image of the skater against the blurred background of the spectators. During panning, use a slow shutter speed – 1/15th…1/8…or 1/4 – and keep the skater in your viewfinder as you press the shutter. A monopod or tripod is essential for good panning, otherwise the skater will be blurry as well as the background. 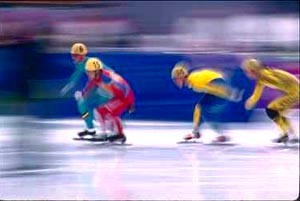 There’s an example of a well panned picture taken during a speed-skating race. What about flash? Many arenas don’t allow it. Even when they do, be aware of the limitation of your flash. The typical built-in flash has a range of just 10 to 15 feet. Will this be enough to light the skater subject from your seat? If you use a separate flash — rather than a built-in — know its maximum range. Can it reach out 20 feet‚ 30 feet‚ 40 feet‚ or even farther? The answer depends upon the particular unit, so read your unit’s specs and know its limitations in advance. So much for figure skating. One final point about these winter sports: When it comes to early-morning hockey practice, we think your best shots may be of those sleepy-eyed moms and pops! « QnA: How do we keep my son’s feet warmer on the ice?